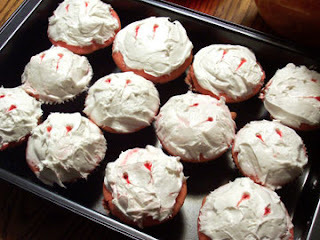 I whipped up these delightful strawberry and vanilla cupcakes... complete with strawberry filling... because what is a Halloween treat without simulated blood and guts? The bites were made by piercing the tops with a skewer and trailing it a bit through the icing with leftover strawberry filling at the tip of the skewer. Here's hoping you have a Halloween filled with plenty of more tasty treats! We're glad we inspired you! These look great and sound delicious! those look soooooo good. i want one. now.